One outspoken analyst says it’s obvious the ‘Zuma faction’ have been up to something for months. Political analyst Andre Duvenhage said it was not surprising that former president Jacob Zuma, along with ANC secretary-general Ace Magashule, former North West premier and former ANC provincial chair Supra Mahumapelo, ANC Women’s League secretary-general Meokge Mathuba and KwaZulu-Natal ANC Youth League secretary Thanduxolo Sabelo are allegedly involved in the “plot” to oust Ramaphosa. 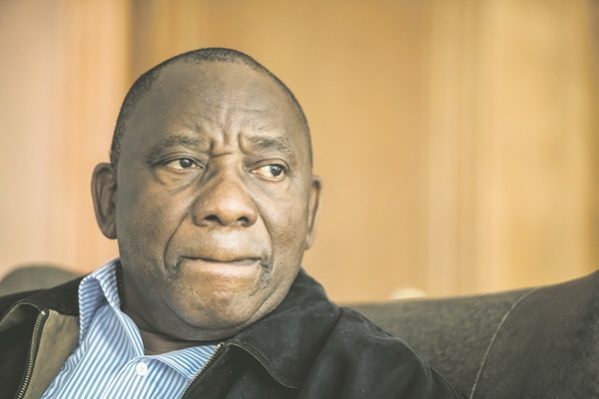 He said this was merely a culmination of a plan that started as long ago as the Nasrec ANC national conference, as soon as Ramaphosa was elected. The Sunday Times yesterday reported that a meeting of the alleged plotters, which took place at the Maharani hotel in Durban on Thursday, was preceded by another at the Beverly Hills Hotel in Umhlanga Rocks, attended by Magashule, Mahumapelo and former SAA board chair Dudu Myeni. Zuma did not attend the first meeting. The Times published a photograph of the group gathering outside the hotel after their meeting, and it said it was in possession of another of them inside. Yesterday the ANC dismissed the report about the plan to oust Ramaphosa as “blatant lies” and “fabrication”. ANC national spokesperson Pule Mabe said the party refuted what he termed “shameless gossip”. “We also reject attempts to link our secretary-general Ace Magashule to this alleged plot to oust the President of the ANC, Comrade Cyril Ramaphosa. It is clear that this malicious gossip is calculated to cast aspersions on the integrity of our secretary-general to the unity and renewal project of the African National Congress,” Mabe said. He said Magashule, like all other leaders, was focused on uniting the organisation. “The leadership collective regards the unity of the ANC as sacrosanct and will oppose any attempts to sow divisions within its ranks,” Mabe said. When telephoned for comment regarding the plot to oust Ramaphosa yesterday, Mahumapelo declined to respond. “I don’t speak to the media, I can’t respond to anything. Please speak to Luthuli House. I don’t want to be disciplined by my party,” he said. Mahumapelo recently resigned as North West premier and was removed as ANC chairperson when Luthuli House disbanded his provincial executive committee. Duvenhage, however, believes where there is smoke there is fire. “I am not surprised. There is no doubt that the Zuma group is mobilising. It’s part of their strategy,” Duvenhage said.